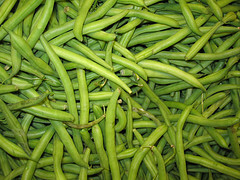 Make those green beans organic! I love green bean casserole, but since becoming an avid organic eater, I have never found suitable french fried onions to add that right crispiness on top, that is, until now! For Thanksgiving, I did find some french fried onions at Trader Joe’s, but they weren’t organic. Yesterday, I finally found organic french fried onions! I’ve tried making my own, but I have never been very successful. The convenience of buying them is appreciated when cooking a big meal. Since I insist on organic ingredients, I do not use condensed mushroom soup in my recipe. I use cream instead of milk to help thicken the casserole (and less of it too), but you can always use less soup if you don’t want your green beans too runny.